I have decided to move the knots to their own page. Knotty knitting? OK, enough with the bad puns. I'll not inflict any more on you. Some of these charts will have part of the stitches in red and the rest in black. This is an experiment in charting that I have been messing around with. I'd really like to hear from you about this. Good or bad I'd like some feedback. There will be a few of these posted soon. The knots charts that are here now are relatively simple. The knots are outlined with YOs and decreases. Each "ribbon" is made from 2 lines of YOs and decs. In the more complex patterns the space between those will be filled in with another set of Yos and decs. I hope this makes some sense; I'd probably better get a few images that are better than this. These lace charts are intended to be used as a starting place for your own creations. They are more of a stitch pattern than a complete design. There are places where you will have to think; sometimes you'll have to make a slanted double decrease instead of a single dec. If you are unsure please email me; and I'll try to sort it out. Usually I have at least the beginnings of a complete design in mind when I start one of these charts but I will never have time to knit all of them. I hope you get some ideas here. You may post pictures of items you make from these charts anywhere you wish. You may do whatever you wish with finished items including selling them. It would be nice if you let me know of pictures; I'd love to see your work. Posted Dec. 7, 2006. This knot was inspired by a knot design from The Book of Kells. And it took only a year and a half to get this charted and posted. Posted June 1, 2005. Here are 3 border patterns in one zipped file. Two are heart designs and one is a lattice. The lattice could serve as a scarf pattern. Yes, it has been a long time since I posted a new Celtic knot pattern; I hope the next one does not take almost 3 years. Posted Oct. 27, 2002. This is a complex knot, in two forms. It is formatted for tabloid paper, please contact me if you need letter sized or if you need a different file type. The two charts here are almost identical. The variation I added was a curilcue on the top botton and sides. Posted Sept. 17, 2002. This is the first chart with some sts marked in red. If you don't like that please let me know and I can send you a not-red version. It is a series of small loops and diagonal lines. Posted Sept. 15, 2002 This is a large rectangle with 4 hearts. It is formatted for legal-sized paper, 8.5 by 14 inches. If you cannot print to that size please email me and I'll make 2 letter-sized pieces. This is a large square motif with four hearts. It is formatted for tabloid paper. If you cannot print to that size please email me and I'll make letter-sized pieces. Posted Sept. 8, 2002. This is a heart-shaped knot. Posted Sept 8, 2002. Large lace knot. This is pretty big and the .PDF file is formatted for tabloid paper. I will try to cut it down so that it can be printed on several pages. email if you would like the multi-page file. Posted Sept. 4, 2002. Knot another knot? Yes. This one is asymmetrical but I like it this way. It is printable on legal sized paper; you can use the "fit to page" option in Acrobat Reader to shrink it to letter sized. Posted Aug. 4, 2002. 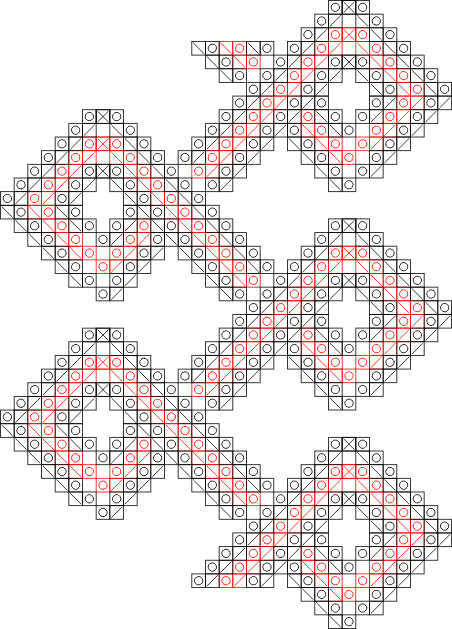 Here's a pattern for a lace interpretation of a Celtic knot. It is intended to be a square piece, started in the center and worked around on circular needles.